CatsCradle is written for professional language translators - a dedicated web page editor that makes it very easy to translate web pages from one language into another. CatsCradle grabs all the text that requires translating from a web page, puts it into a built in editor for you to translate alongside, then automatically integrates your translated text back into the web page - leaving all the sensitive HTML code untouched. ...... To check all's going smoothly you can instantly preview your work in progress in a web browser at the click of a button. There's even a real-time view where you can see the web page evolving as you translate. And it's free! 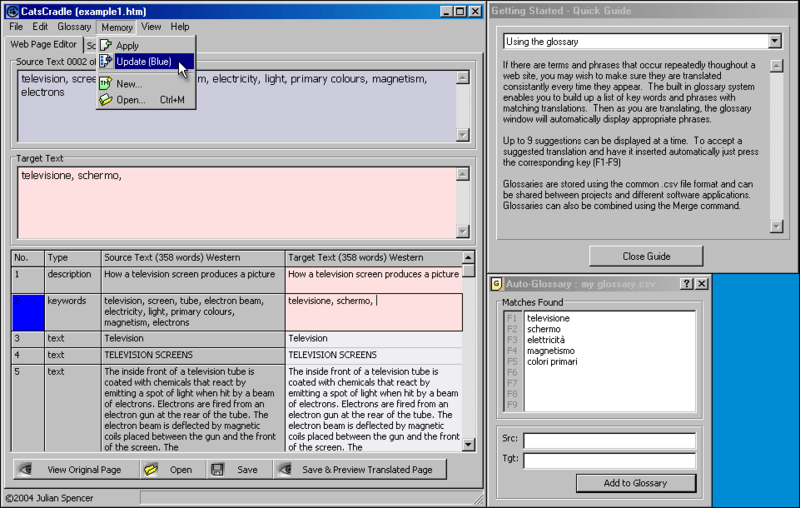 - A multilingual GUI in 12 languages (Afrikaans, Brazilian Portuguese, Dutch, French, German, English, Hungarian, Italian, Polish, Russian, Spanish and Ukrainian). - Built in Glossary that can suggest appropriate words and phrases while you are translating. - Built in Translation Memory System. - Project file catalogue with word count (can produce word counts for whole folders of web pages). - As well as web pages CatsCradle can handle .hhc and .hhk help contents and index files, so it's suitable for translating .chm help files too. Qweas is providing links to CatsCradle 3.92 as a courtesy, and makes no representations regarding CatsCradle or any other applications or any information related thereto. Any questions, complaints or claims regarding this application CatsCradle 3.92 must be directed to the appropriate software vendor. You may click the publisher link of CatsCradle on the top of this page to get more details about the vendor.